An unspoken goal I’ve made this year is to bring more calm and tranquility into my life. I think sometimes I get addicted to the rush of being busy, but the aftermath leaves me feeling so exhausted and de-energized. That’s completely the opposite of how I want to be feeling. I think with calm and tranquility comes simplicity–or maybe it’s the other way around. 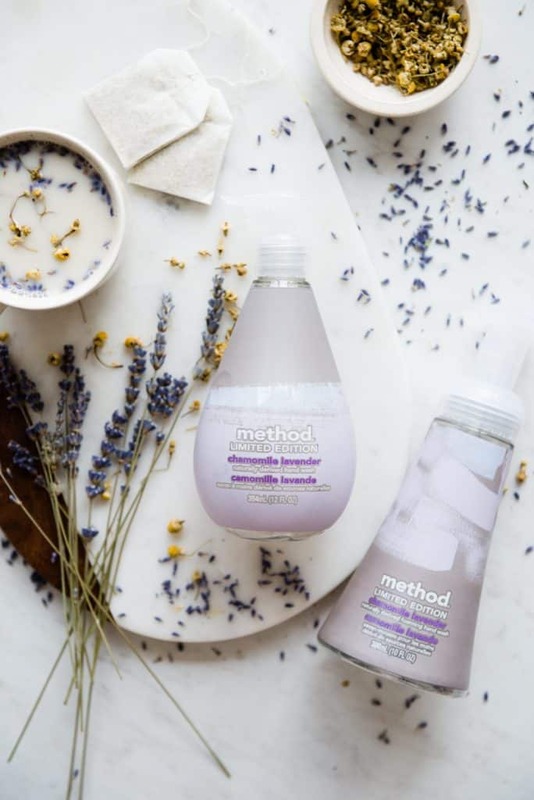 In any case, I’m really digging method’s spring limited edition collection, especially the Chamomile Lavender, which is instant aromatherapy every time I use it. 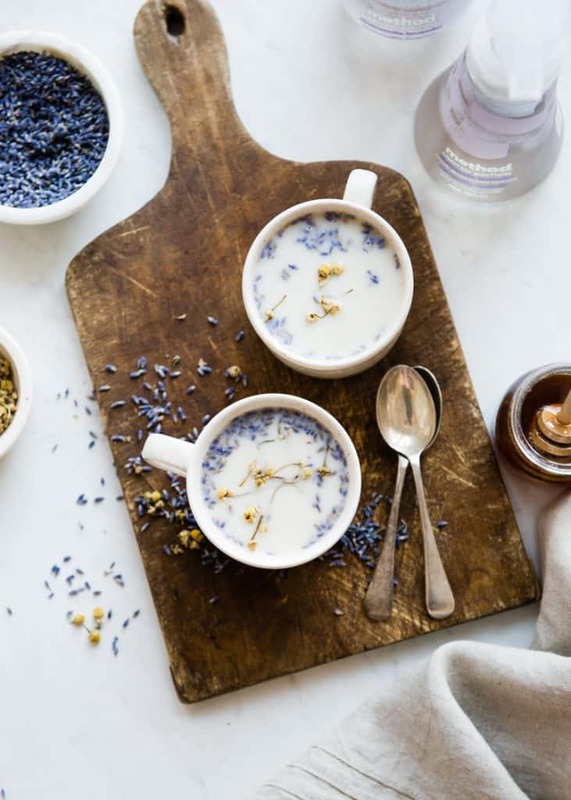 I felt inspired to create a calming Chamomile Lavender Latte based on my favorite scent from this new collection. At night, when it’s quiet and dark, it’s the perfect time to heat up some milk to make this latte. I brew the chamomile tea right in the milk and add dried lavender buds, which release their aroma as the tea steeps. Grandmothers everywhere have sworn by warm milk to help you sleep and this takes it a step further. 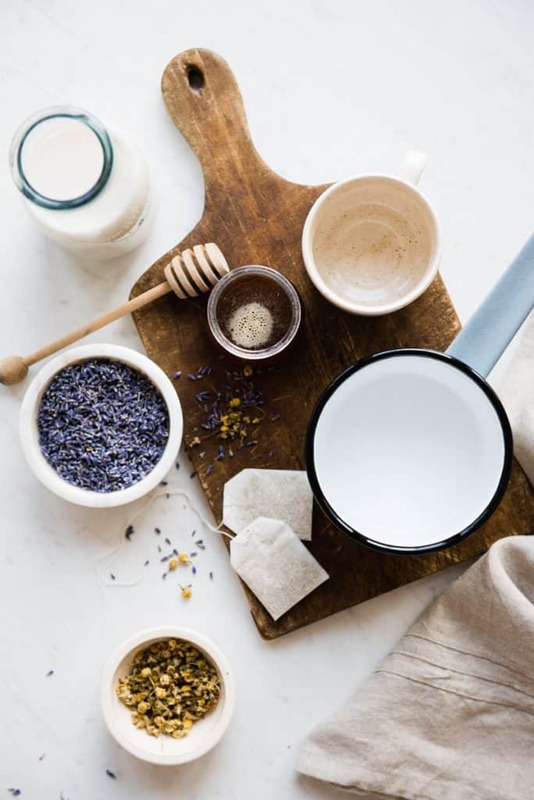 Chamomile has been used for centuries to help induce relaxation, aid sleep, calm an upset stomach, and it’s also used as a natural anti-inflammatory. 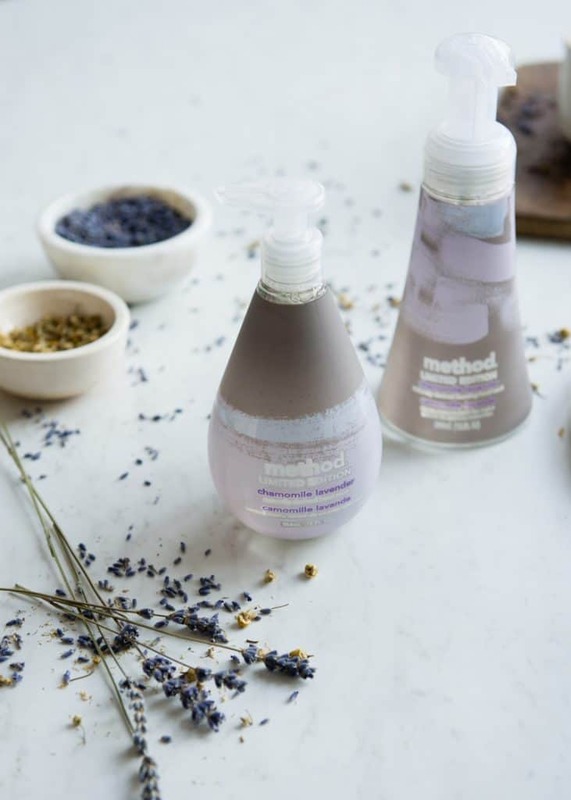 Lavender plays a role in natural relaxation too, especially at bedtime, by helping alleviate nervous tension and stress. One sip of this dreamy latte, will help you forget all your troubles of the day, if only for a few minutes. I’ve become a little addicted to my nightly Chamomile Lavender Latte. All it needs is a touch of honey for sweetness, which goes so nicely with the floral aromas and flavors. 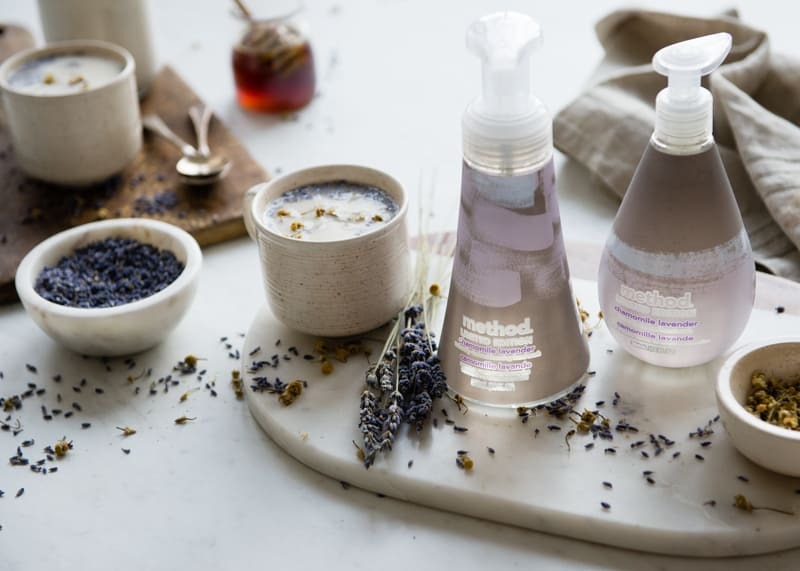 It’s like creating a little mini-spa experience right in your own kitchen. Call me crazy, but washing dishes at night is kind of a zen experience of its own. The chaos of the day has ended, and it’s just me and my dishes. The mundane household tasks are my favorite because I can slip into autopilot and let my mind relax and wander. 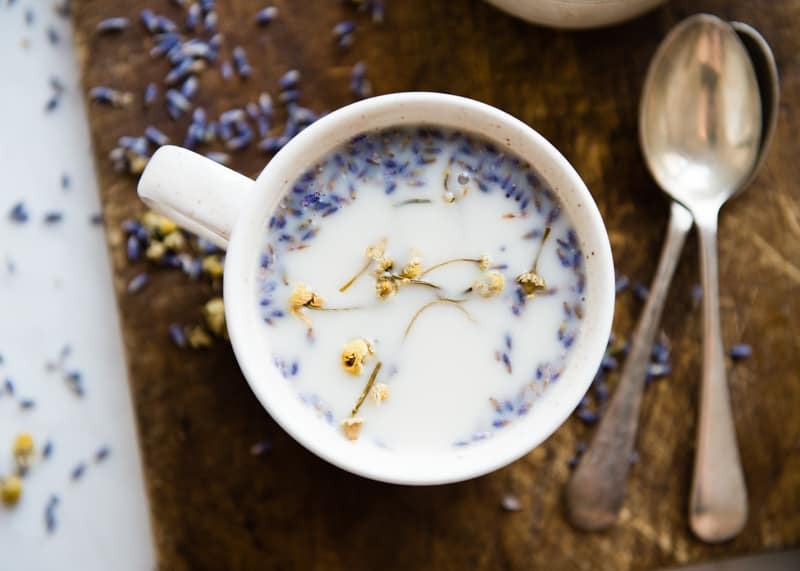 This warm, calming latte is infused with chamomile and lavender to help you relax. Heat milk in a small pan until very hot, being careful not to let it boil. Add the chamomile and lavender to the hot milk. Let steep for 5-10 minutes, then strain the mixture into a mug. Sweeten with raw honey or maple syrup and add vanilla extract, if desired. Hello Glow has partnered with method in creating this post, but all opinions are our own. Hi! This recipe looks amazing! I can’t wait to try it! Where do you buy lavender buds from? Are there some brands you recommend? I’m wishing I had lavender buds on hand to make this right now! I love the idea of an evening calming routine and may start with this one. It looks lovely – the shade of lilac is really photogenic! This would be a great drink for a girly tea party with the girls.